"Let's go in and check out their resort, pretend we're going to held an event here" said my boss smiling before turning our rented car to enter The Westin Resort Nusa Dua front gate. Judging by Nusa Dua's reputation as the staying place of movie stars and presidents, this invitation alone gives a sheer feeling like we're doing something forbidden. 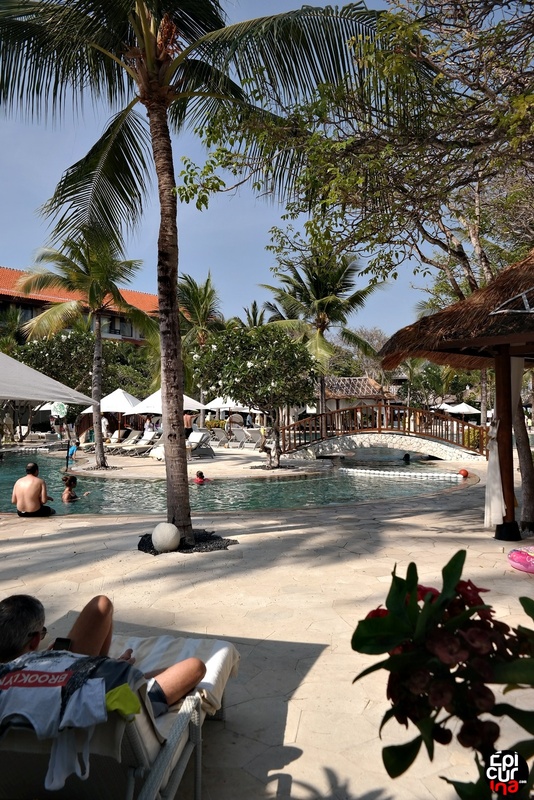 But that was about ten years ago, when the image of staying in one of Bali's top resorts is just a distant dream, especially for someone with entry level salary in an IT startup company. 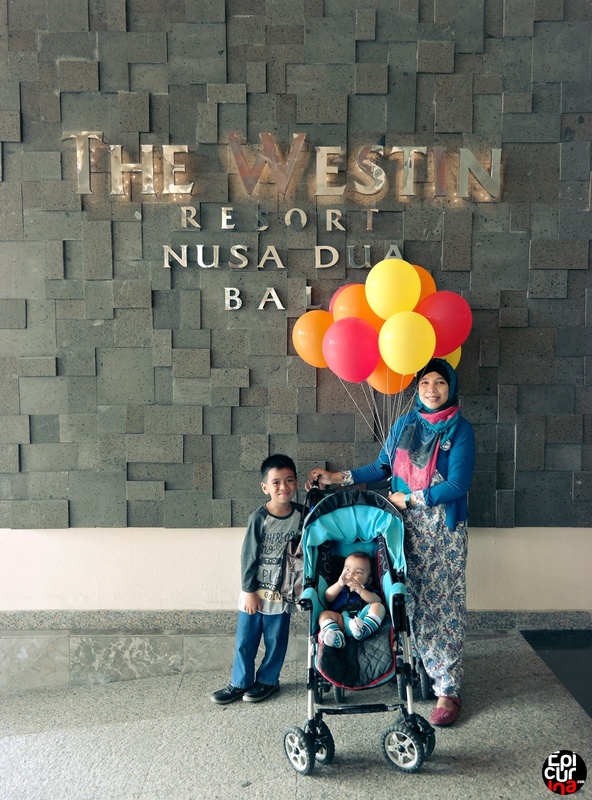 Our perception of Westin changed however, since the early years of us moving to Bali. 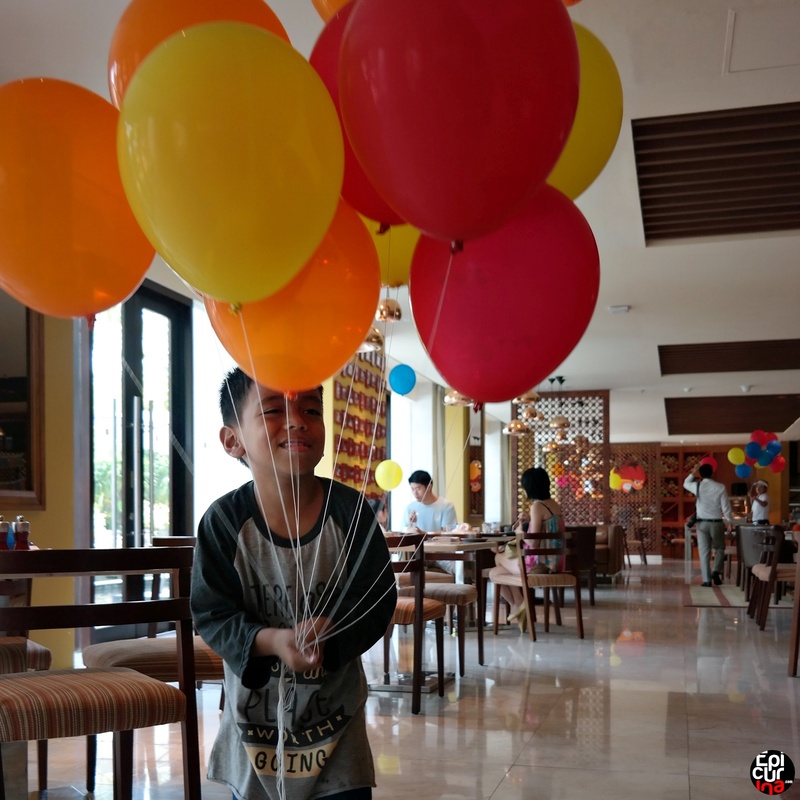 Westin has been a highly supportive venue, and a close companion for our Bali food blogging activity. 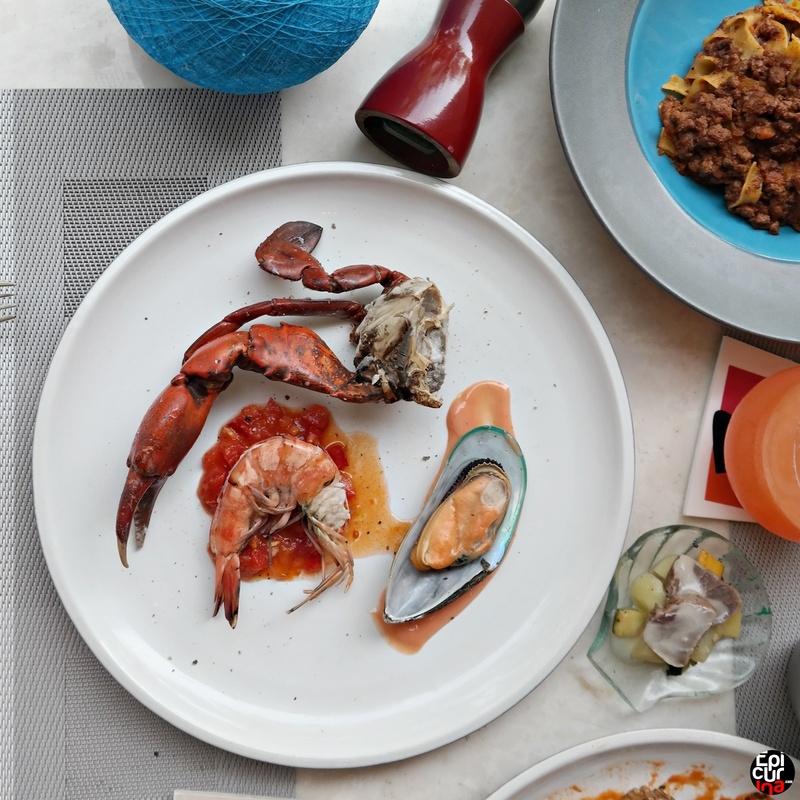 Starting from the numerous invitations to Prego's Family Brunch, participating in charity shows for Unicef involving nation's rising stars, invitation to annual appreciation dinner, and last but not least, a staycation chance! Just a fresh reminder, "staycation" is a form of vacation where we focus on experiencing the whole offers that a destination hotel have, to take advantage of the hotel's included amenities and facilities. 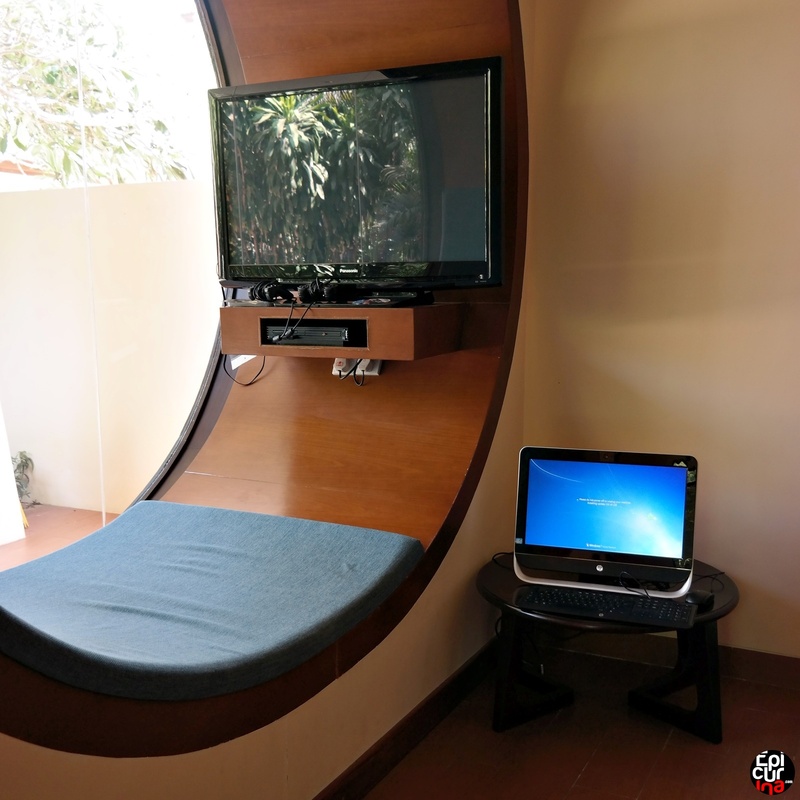 Recently staycation has also been recognized as the sustainable tourism way to make our travel more eco-friendly. 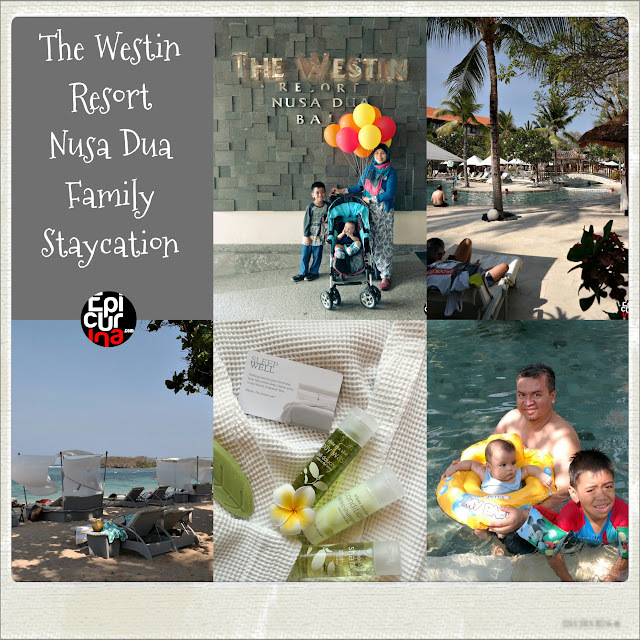 With the huge size of Westin Nusa Dua, and lots of entertainment options, we eagerly started our journey. Westin has one of the largest hotel lobby on the island, definitely, with high ceilings all the way to the roof. 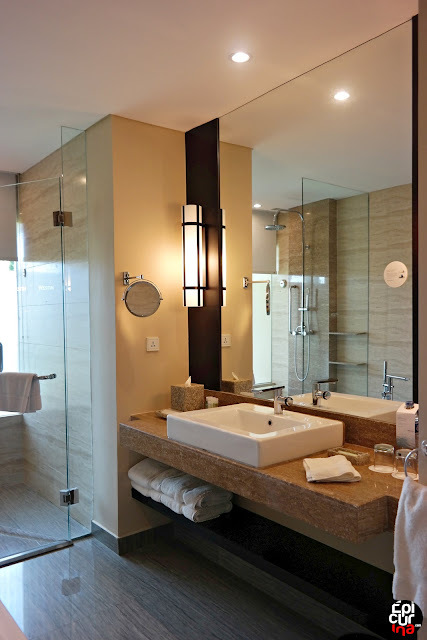 The interior emits the conservative luxurious feel, dominated with dark brown solid woods and white marbles. This condition alone helps setup the feeling that we're starting something grande. 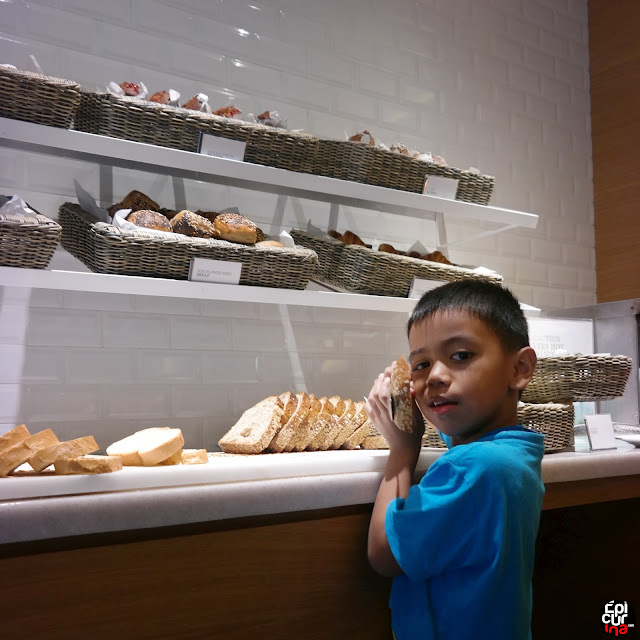 After a smooth check-in, we're escorted to our room in Westin's new hotel wing, right above Prego Restaurant, which has becoming quite familiar for us as one of the island's top family brunch destination. 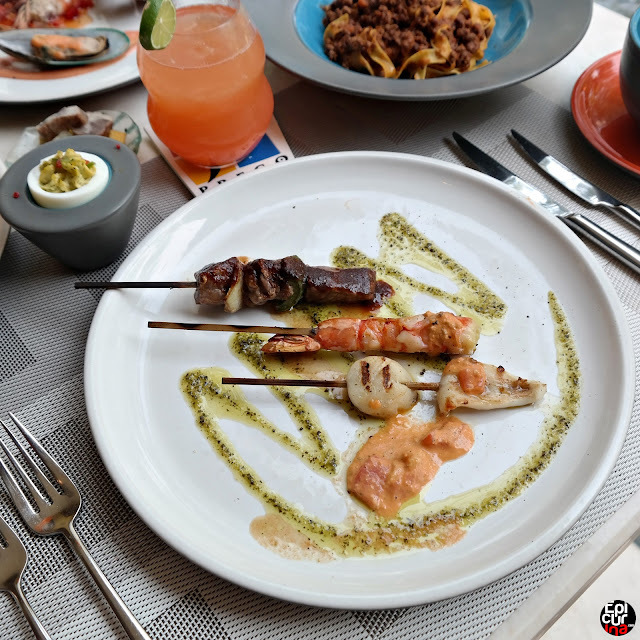 More on it later, as our staycation includes Sunday Brunch at Prego! Our room exist almost at the end of the alley on the third floor. While it's not the biggest room we ever stayed in, it comfortably fits two huge beds, a couch, a receded desk, and there's also a comfy balcony with garden view. By the way, please don't mind our kid's expression, it's something he caught from his friends at school which seems to be their smiling standard now, and he's been practicing this style constantly in every picture we shot that day. So this is his happy face, for now, please bear with it. And no it's not contagious, not to adults at least. 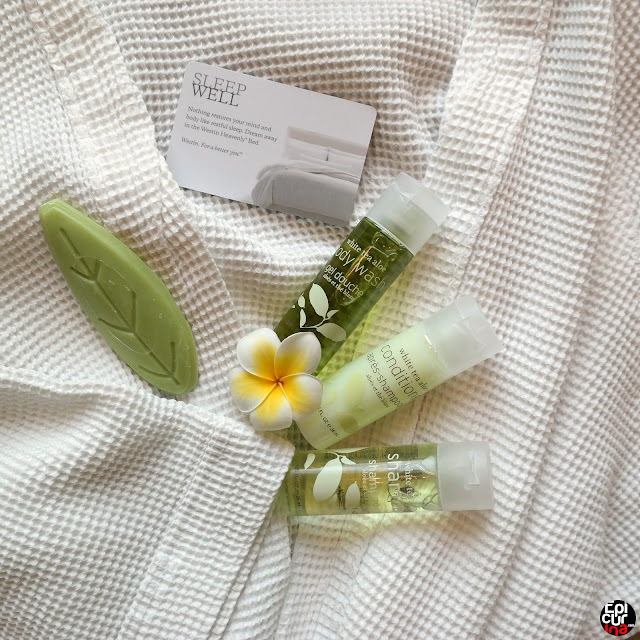 On the bathroom, beside of the large bath tub, we were also pleased to find the scented soap and bathroom amenities ready to help us refresh after our long travel. After we settled down, now it's time to scout around the resort for facilities that we can enjoy. 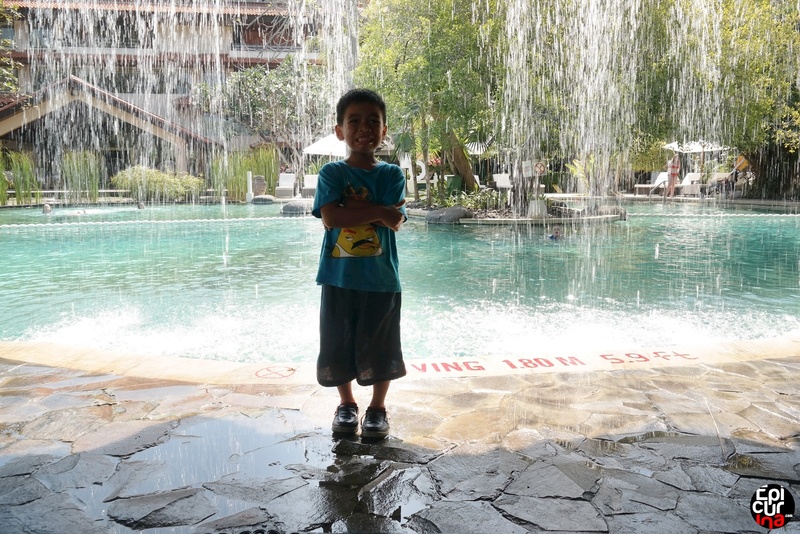 Our kid surely love the pools, and there's even an artificial cave with waterfall that feels like you're on a treasure hunt. 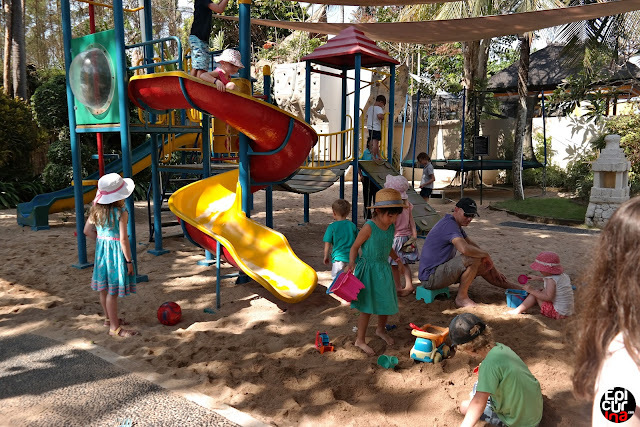 The biggest draw for our kid attention though, was the resort's Kids Club, and beside the pools, that's his benchmark to determine if a resort is cool or not. 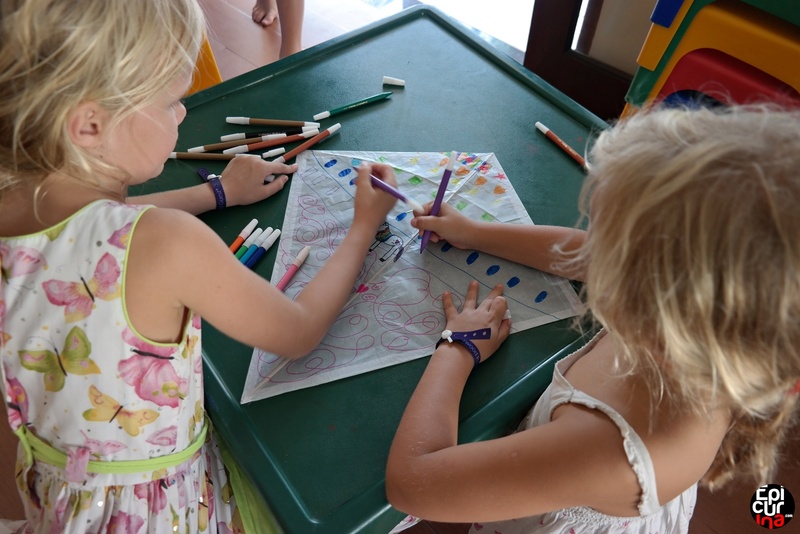 After taking a long walk passing the lobby and the restaurants, we finally arrived at the Kids Club at the other end of the resort. We're there just in time for a kite coloring session, and our boy thinks it's cool, so I left him there with all the small people. Outside there's also a lot of physical activity facilities, so if he ever get bored with the all the drawings and kite flying, he'd have a lot of options. 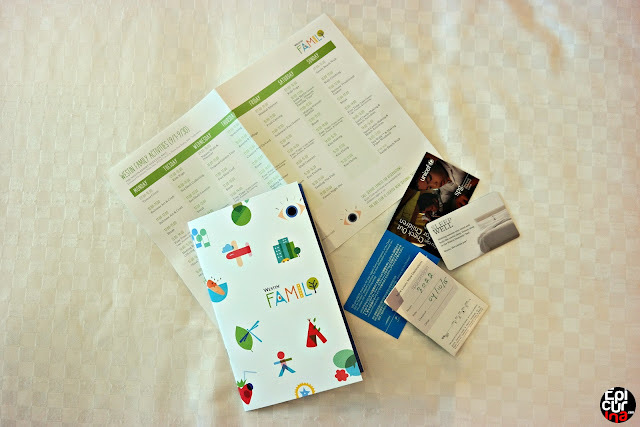 What's interesting with Westin's Kids Club is that it's a complex made up from three different facilities organized by age. The one that my kid in, was for children whose in early school years. For even younger children under 5 years old, there's a separated facility right next door. It was less populated than the main one though. If you think the two grouping is already impressive, turned out that Westin has a third section which devoted for teenagers! Here you can find youngsters enjoying their time watching movies, playing Playstation, or simply reading books from the library. It was set as a lounge, so it has this nice relaxing feeling. Outside nearby, Westin has a pinkish white sandy beach complete with sheltered and non sheltered beach bunks. 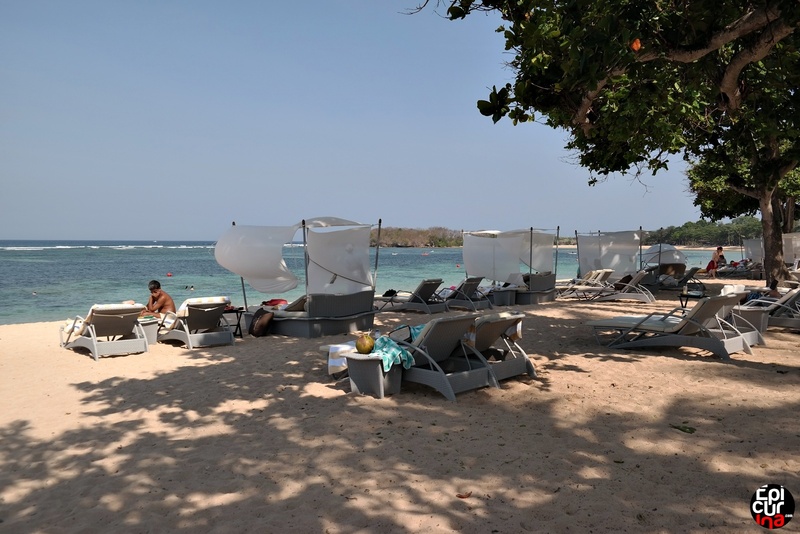 It's an ideal space to laid back and enjoy the serene beach with gentle breeze, something that Bali is best for. Not ready to jump into the salt water yet? Westin's interconnected swimming pools is the one you should be at then. It's made up of several swimming pools with close distance from one to another, together creating a huge swimming pool complex, with the water that still feels fresh, despite its closeness to the sea. Something hotels in Kuta area are now struggling with, due to the sea water abrasion. 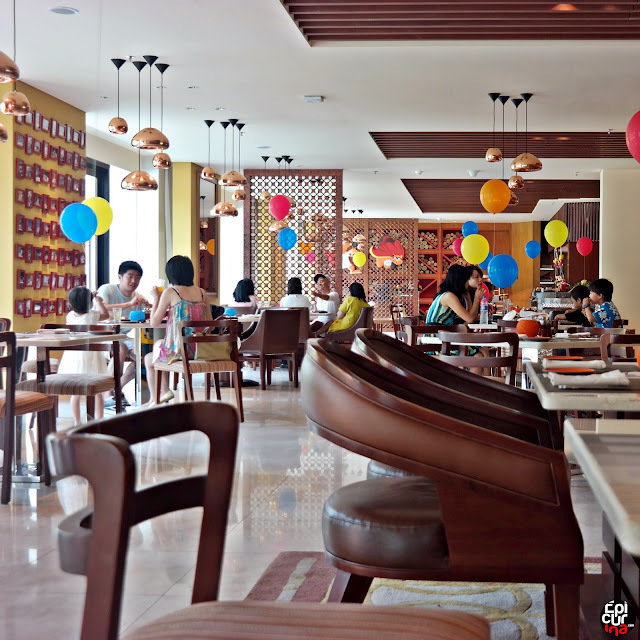 On the next day, we eagerly rushed down to Seasonal Tastes restaurant to have our breakfast. Staying truthful to our epicurean nature, breakfast is certainly something we're looking forward to. We were quite surprised to see there's a Halal Food station set up during Breakfast. Beside of some hotels targeting domestic tourists, we almost never seen such feature, especially in a five-star resort like Westin. 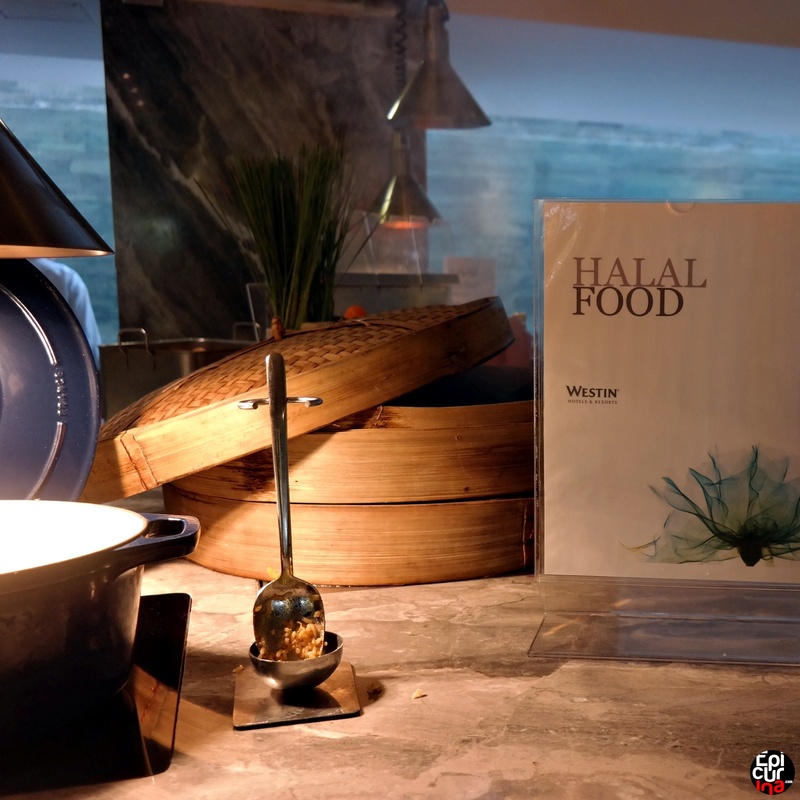 Other than the halal station, most of breakfast items in Westin are clearly labeled whether they contains pork or not, vegetarian or not, that help the guests to quickly recognize which food matches their dietary rules. 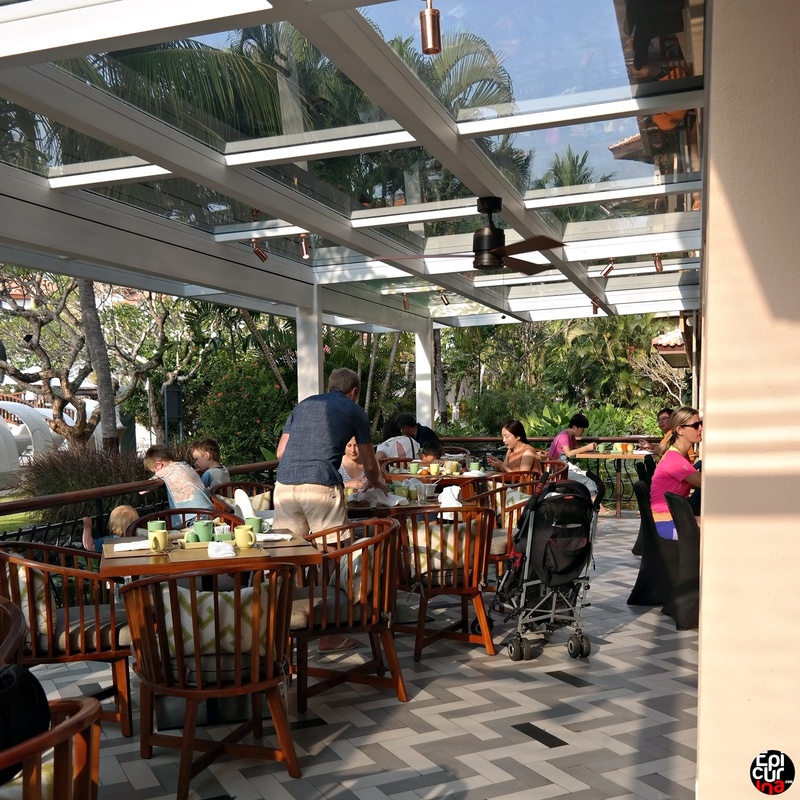 Outside of the traffic and the commotion of breakfast, we found food at Westin was good, very well catered, heap of menu choices to pick, and we especially love their Indian food station, it was awesome! One of the best breakfast we ever had in Bali hotels. Temperature is a bit challenging though, as we're staying in Westin during one of the hottest seasons in years, we found the heat is quite high, even on the corners of the restaurant which have air conditioners. As basically the restaurant is open spaced, make sure you dress lightly, and come early to get the coolest spot on the venue. 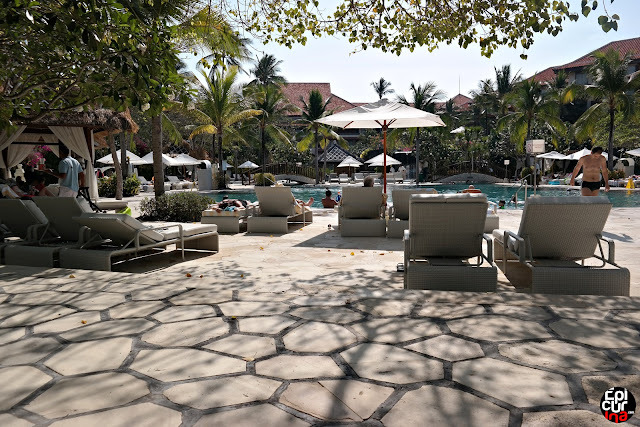 After we've done with the amazing breakfast, now it's time to try the waters, so we heads down to the swimming pools which located right outside of the restaurant. Sadly we found most of the ideal spots have been reserved, but this is something we now realize as a common happenings in Bali hotels: mark your ideal pool side bench by leaving something of your personal belongings, before you go for breakfast. This way you can ensure to get the best pool experience later after you eat, which usually meant shaded benches, and this is important as Balinese sun tends to be unmercifully hot. Good for skin tanning, but not for someone already on the dark side like me. The skin, not the force. To close our staycation experience in Westin, we're thrilled to end it on a high note with Westin's Family Sunday Brunch at Prego. 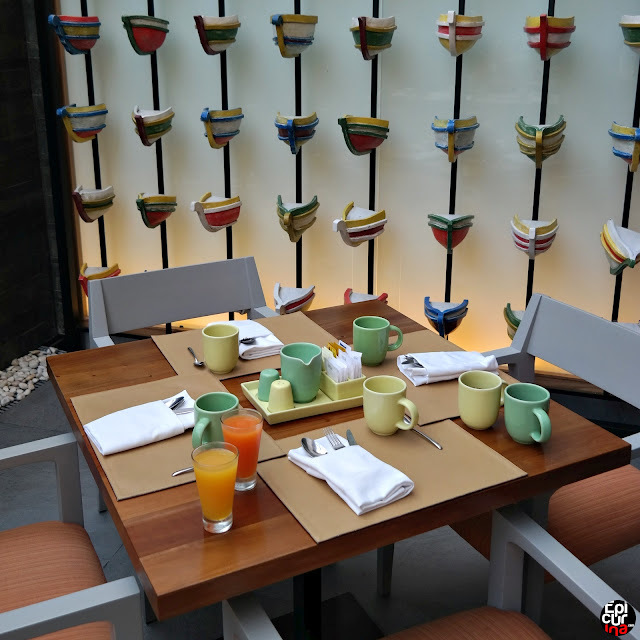 Prego is an Italian restaurant that focuses on "fun dining not fine dining" and it's Family Sunday Brunch is designed to entertain the whole family. My favorite part of Prego are their fresh pasta station, where I can order any kind of pasta Prego have, and it's a lot, cooked upon our order. Next is the cold seafood table where prawns, crabs, and mussels are lying down gorgeously on the ice rocks. The rather new grilling station is responsible for the delicious seafood bbq and meats, including steaks and kebabs. 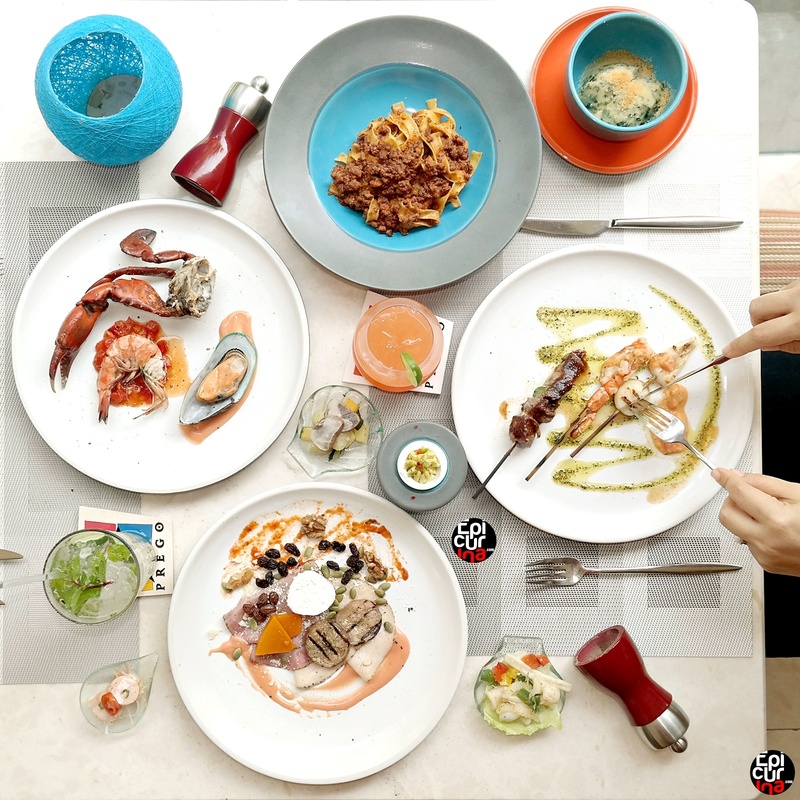 There are special of the week's menu which revolves between fish or other type of meat, some options for soups, grilled vegetables, a long table of antipasti, lots of delicious cakes and gelato, and last but not least, the cheese station. Well in fact it's among my favorite stations in Prego, as they have a good selections of both young mellow soft cheeses, and old mature strongly flavored ones. I usually comes to this section first and assemble my plate of cold cuts, grilled vegetables, cheeses, seeds, nuts, and even fruit jams from the nearby bread station. As a father however, I want to also ensure that my kid is having a good time as well. 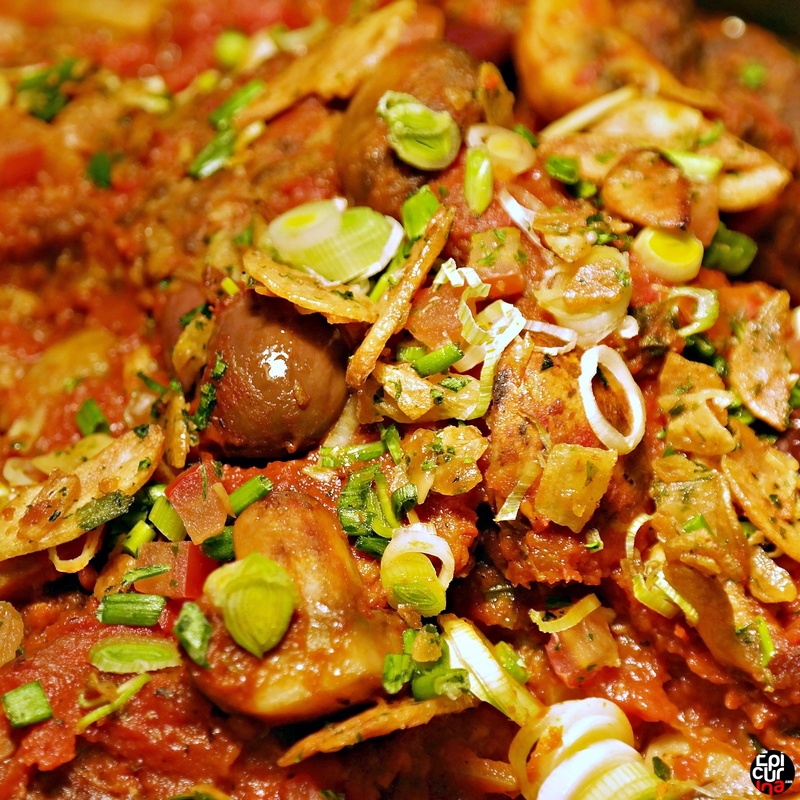 As he's quite picky with what he eats, he find the fresh pasta station as the only choice, and he always go with the Bolognaise. Pancakes and chocolate cakes are also his favorite, but we don't usually let him roaming in those stations unless he finished his plate of pasta first. Outside of the food, we find the activities in Prego Family Sunday Brunch really engaging. 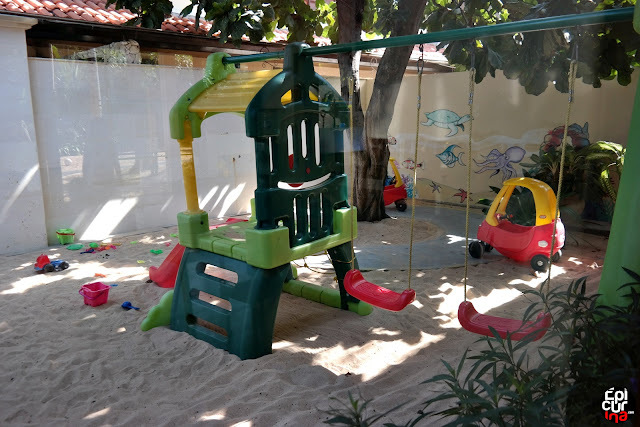 Whether it's playing Playstation games with newly met friends, outdoor activities like face painting or ball games, Prego has cute mini stations to cater for our kid's sweet tooth, like popcorn stall, ice cream cart, and cotton candy corner. 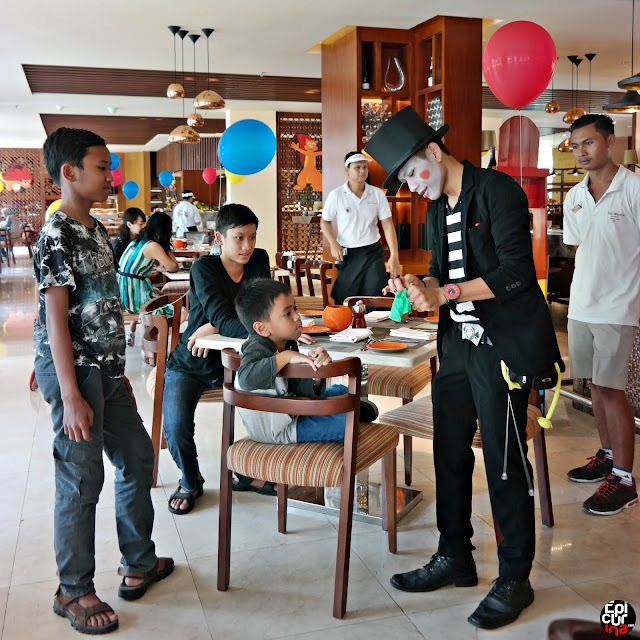 They even have magic shows that made our kid both entertained and curious. 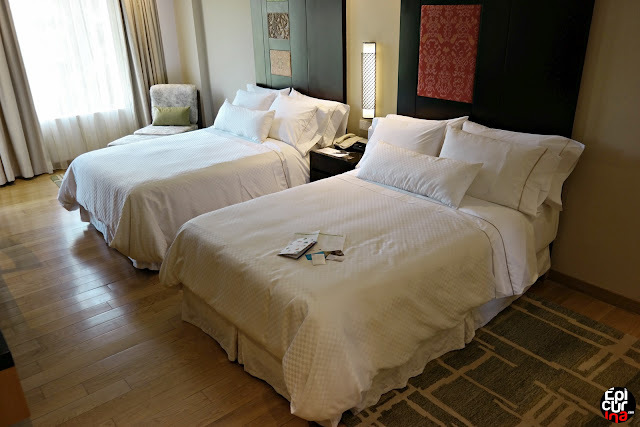 It's been one kind of a stay, a little bit hectic due to the high season, but we find the quality service made up for what Westin might lacked. Our concerns are promptly addressed, the food was good, and our room was comfy. 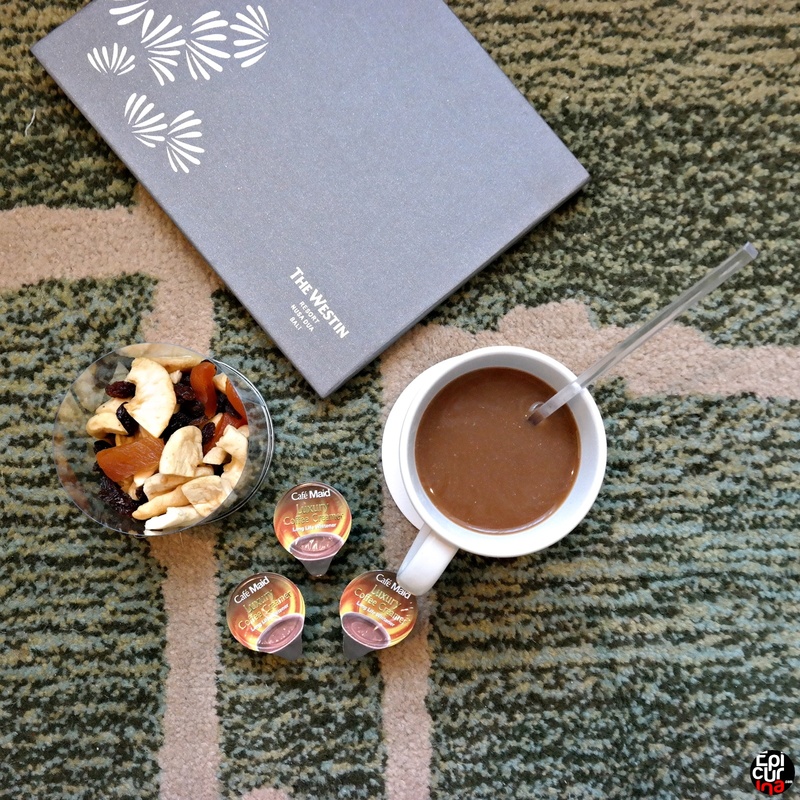 Nice surprise for the halal section on breakfast, and everything else creates memorable impression. 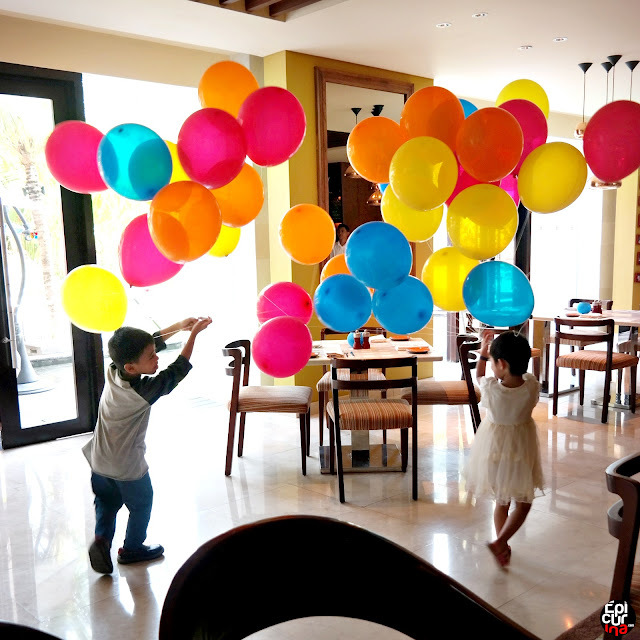 As a blogger with two kids, the availability and quality of kids activities sits high in our checklist, and with the three kids club which includes outdoor activities, kids friendly selection during our breakfast, large bath tub, and huge swimming pool, our kid was surely entertained.